Last night it rained, an honest, garden-soaking, puddle-making rain. It hadn’t rained in 48 days. (Seattle’s record dry spell, set in 1951, was 51 days.) On the way out the door this morning, wrapped in coats against the newly-brisk air, my four-year-old cheerfully sang out our family’s frequent admonishment to her toddling little sister: “No boots, no puddles!” It suddenly felt like fall. It’s as good a day as any to put on a pot of beans. I’ve already said my piece about why you should cook your own beans when you can (to recap: cost, taste, BPA, the DIY spirit). That’s not to say that I don’t use canned beans, though; they’re a healthy-enough convenience food when I haven’t had time to cook dry beans from scratch. If you are lucky enough have freezer space, make an extra-big batch and freeze your beans in 2- or 4-cup portions in their cooking liquid. It’s almost as convenient as having canned beans in the pantry. 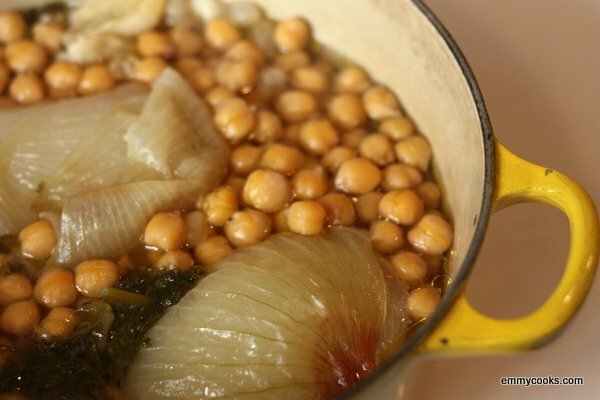 There’s also another particularly good reason to cook your own chickpeas, and it’s this: the resulting broth is amazingly flavorful and delicious. Promise me you won’t throw it away. Use a little bit to lighten up your hummus, use it as the base of a chickpea soup (with some nice greens added, maybe), use it in any recipe calling for a flavorful broth. Add pasta and a few tomatoes, shower with parmesan, parsley and olive oil, and you have yourself pasta fagioli. If you have any chickpea broth left over after all these uses, add it to your freezer stockpile for making your homemade vegetable broth. How to Cook Chickpeas: Soak one cup* of chickpeas overnight in water to cover them by a few inches. (Alternatively, quick-soak them by bringing them to a boil for a minute, then turning off the heat and leaving them covered for an hour.) Drain and rinse, then transfer to a pot and cover the chickpeas with 8 c. water. Bring to a boil, then reduce heat to a simmer and add a peeled, halved onion (with the root end left intact so it holds together and is easier to remove later), a few smashed garlic cloves, a few sprigs of parsley, and a splash of olive oil. (You can also add a square of kombu or a few shakes of asafetida, both rumored to reduce beans’ gassy effects; I usually add the latter, but it’s more out of habit than because I’ve ever noticed the difference.) Boil until the beans are softened but not fully cooked, then add 1 1/2 tsp. salt. Continue cooking until completely tender, which can take a long time. Count on 1-2 hours’ cooking time for soaked chickpeas. *One cup of dry chickpeas will yield about 2 1/2 c. cooked chickpeas. Double or quadruple the recipe if you wish, just make sure that you are using a big enough pot. You won’t need to fully double the water, just make sure that you cover the soaked beans by a good few inches and add more boiling water if too much simmers off during the cooking process. Reduce the salt as well if you reduce the water, keeping the ratio around 3/4 tsp. salt per quart of water. This entry was posted in Beans and Other Legumes, DIY, Easily Multiplies to Feed a Crowd, Food, Recipes, Vegan or Would-Be-Just-As-Good-Vegan, Vegetables By Themselves and tagged ceci beans, chickpeas, cooking dried beans from scratch, garbanzo beans, garbanzos, home cooking on September 10, 2012 by emmycooks. I love the taste of chickpeas and their nutritional value as well. I usually buy jars of pre-cooked chickpeas though because of the time I save [mostly the time frame from deciding what I’d like to cook and eating it]. I’m inspired by your suggestions for chickpea broth and am heading to the kitchen to start soaking. I never thought about freezing the cooked chickpeas or beans – thanks for the tip! It was nice to get some rain and freshen the air up, and now it’s wonderful to have the sun return. It did get me in an autumn frame of mind, though – I bought some honey crisp apples yesterday, which I’m quite excited about. The one kind of bean that I don’t usually make from scratch, but I will now! Especially now with all of your ideas for using the resulting broth! Every time I open a can of beans I wish I had remembered to take the time to cook some ahead of time. Thanks for the tip about freezing them! Too funny…I did Seward Park this morning and didn’t even notice the puddles except to have to tug the puppy along away from them…so apparently it did rain last night!! I’m said that summer is coming to a close, but I adore Fall and Winter cookies, so worse could happen! I love cooking my own beans but sometimes used canned as well for convenience. I really like how you put the whole onion in with the ends intact! I’m soaking garbanzos now and will follow your directions! Funny, I have my own post on cooking chickpeas as a draft in progress at the moment. Tis the season! Just wondering, how do you store your asafetida? I bought some once for Indian cooking and had it double bagged in zippered plastic bags, but still couldn’t bear the ‘aroma.’ I had to throw it out 😖. I’ve frozen my chickpeas after draining and individually quick freezing them on cookie sheets. What do you see as the advantage of freezing them in their cooking liquid? BTW, I’ve used your tip from other cooking legume posts to freeze the cooking liquid separately for soups, etc. Brilliant! I get such good ideas from your blog! Sounds WONDERFUL! SO glad I read this just now – I’m putting some beans to soak right away! Thank you for a beautiful blog-post, inspiring recipes as always!